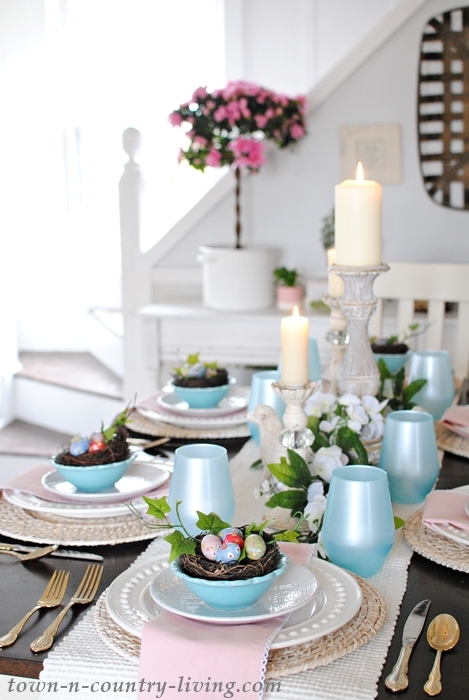 Welcome to the Easter edition of Styled + Set where a group of bloggers share their ideas for dining and entertaining during a holiday season. Jennifer at Celebrating Everyday Life is the blogger just before me and I just love her trophy centerpiece! 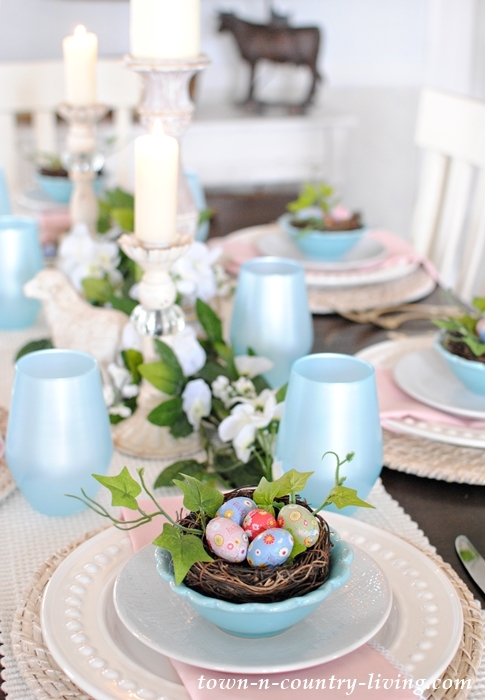 I’ve set a pink and blue Easter table setting to give you inspiration for your own holiday celebration. 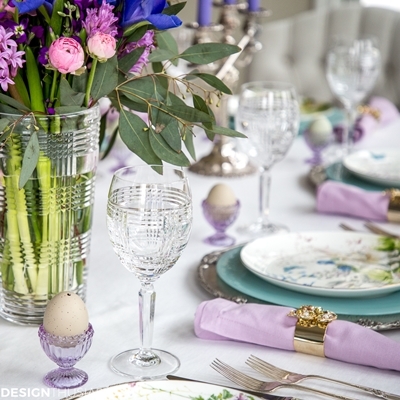 Easter for me means pastel colors at the dining table; I chose pink and blue this year. Pale blue tumblers were a lucky find at HomeGoods. The shape of the glasses reminds me of Easter eggs. Woven straw chargers cradle white plates and a blue bowl. 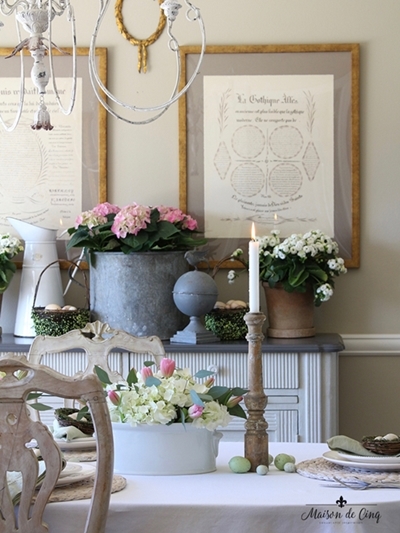 A pale pink napkin with white crochet edging adds a soft touch of color. Tall white candles and greenery add to the white textured table runner by Tommy Hilfiger. 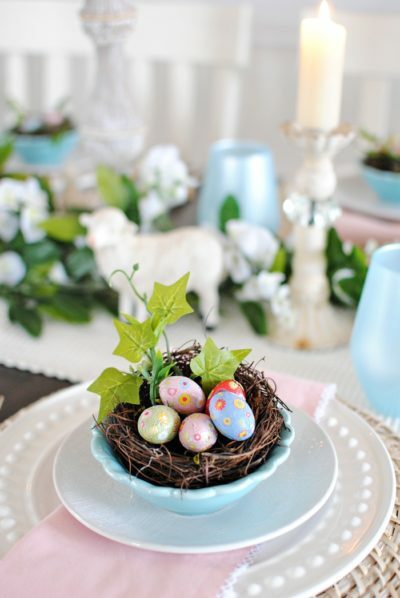 The center of each place setting is a small bird nest with wrapped chocolate eggs for each guest. 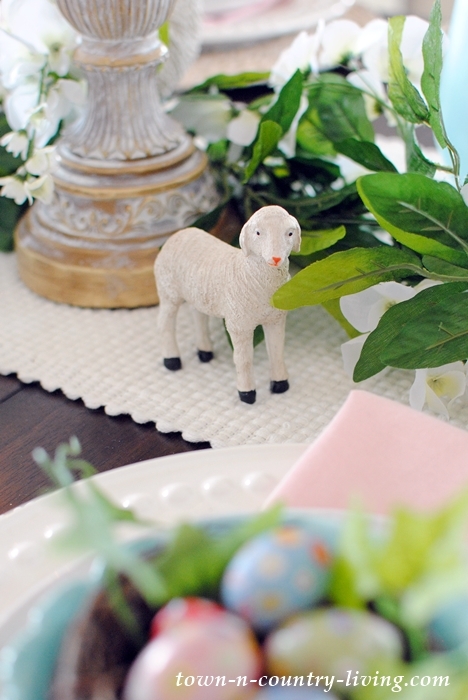 Small sheep are tucked near the greenery to emphasize the Easter theme. 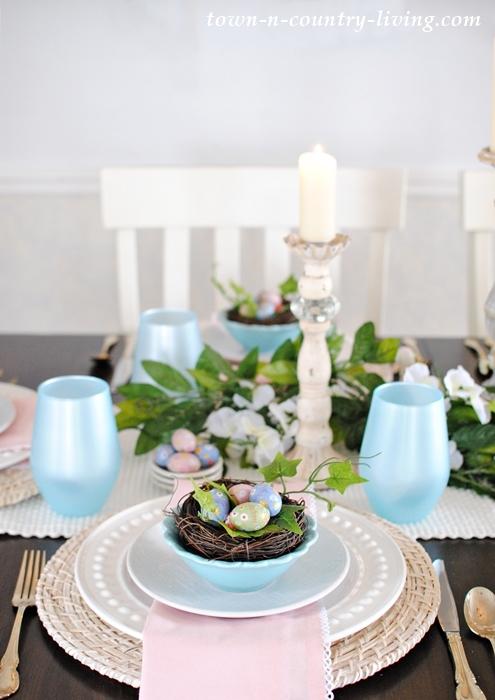 I’ve always loved pastels and I’m especially fond of my pink and blue Easter table setting. 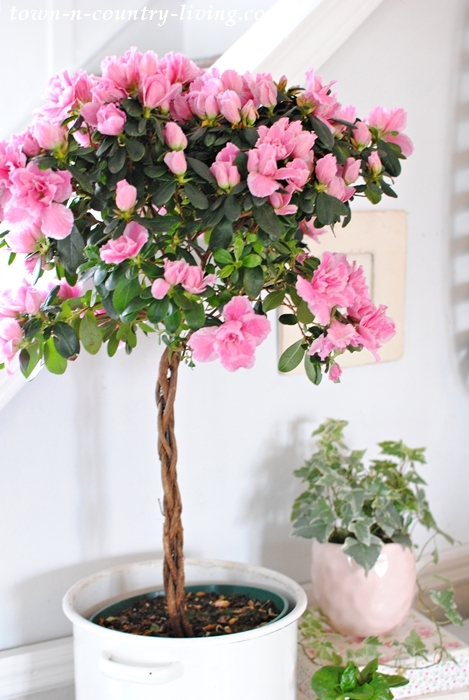 Hubby gave me a beautiful pink azalea topiary for Valentine’s Day. He was smart enough to choose one that was full of buds as opposed to an azalea that was already in full bloom. Now I can enjoy the pink flowers for a longer period of time. The bird nests have tiny twines of ivy. 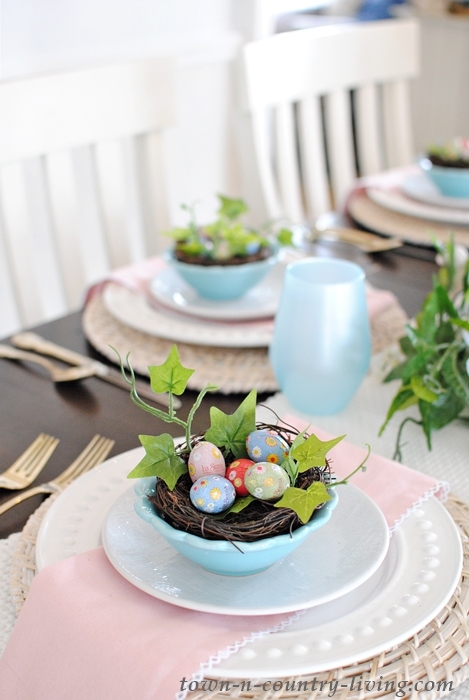 My pink and blue Easter table setting is ready for the family. We like to enjoy brunch together on this spring holiday. I still need to plan the menu. Next up on today’s tour is Cedar Hill Farmhouse. I think you’ll enjoy Anita’s French Country style. The rest of today’s bloggers are listed below. What a sweet table! The lambs are the best touch! And hubby hit a home run with the azalea topiary. What a treasure for years to come. Your dining room has inspired me. Thanks, Deb! 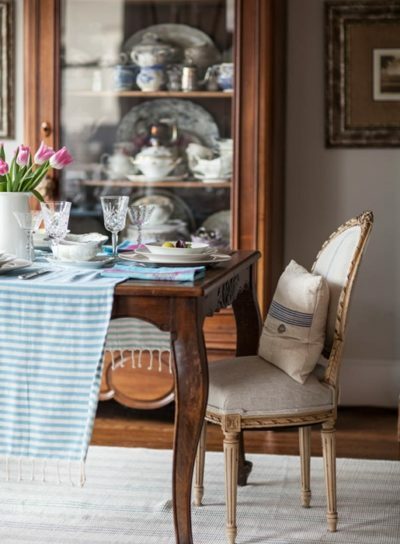 I have to admit the pale blues have put a little pep in my step when I walk through the dining room. And tomorrow we’re nearing 60 degrees – can’t wait! Such a pretty table! The blue is such a beautiful shade! and looks perfect with your pink napkins and white dinnerware. 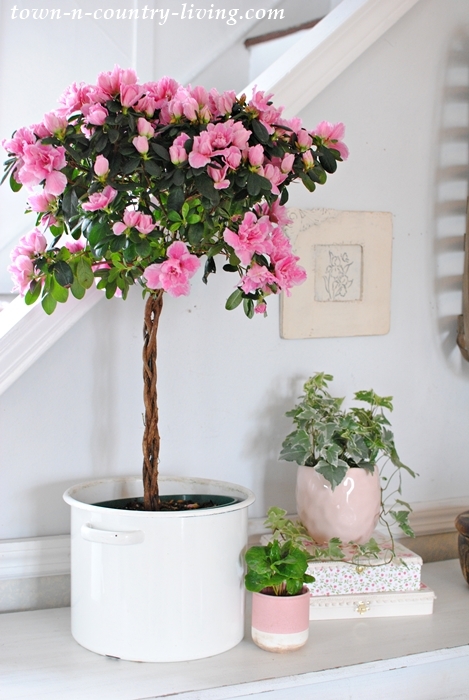 Love it and your gorgeous azalea topiary! 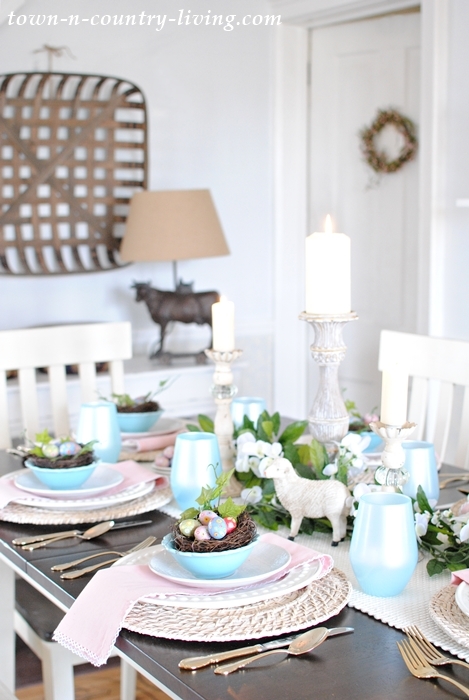 I love the blue, pink and white Easter table. It is charming and something we all can relate to. I know how much you love sheep, so have you seen the new Pottery Barn pillow with two sheep that is embroidered with the words “Ewe and Me. ?” It is so well done, as are most PB things, without looking cutesy or childish. If you haven’t seen it, check it out online. I thought of you when I saw it. Aw Pat. How sweet that you thought of me when you saw the sheep pillow at PB. Going to check it out now! You are Queen 👑 of table setting. You will enjoy you dining room this year. Easter is the one holiday I don’t decorate for since we go to family every year. I have started changing this up with greens and my love, Lavender. Beautiful Azalea from the hubby. Going in the courtyard? Thank you, Cindy! I didn’t think to put the azalea in the courtyard (once we have one). I don’t know how it will fare outdoors in Zone 5 but now I need to find out because I love the idea! ………every thing is beautiful, you will probably have the windows open with a nice spring breeze blowing through. I love the way you have presented the little LAMB. After all isn’t this what the occasion is all about. jennifer, your table is so pretty. 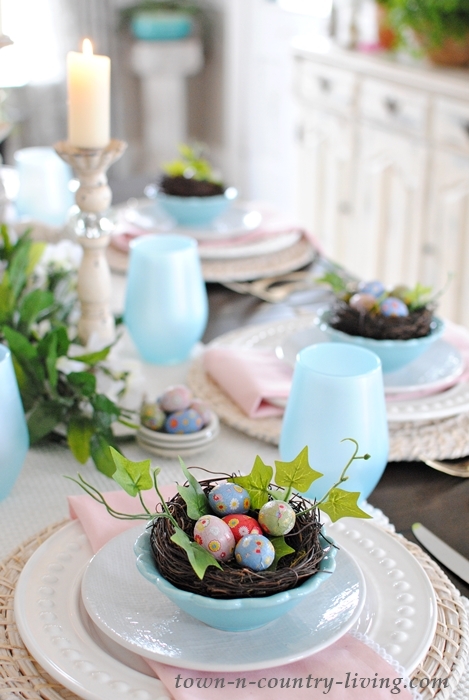 love the blues and the color on the azalea topiary is perfect for your Easter table. 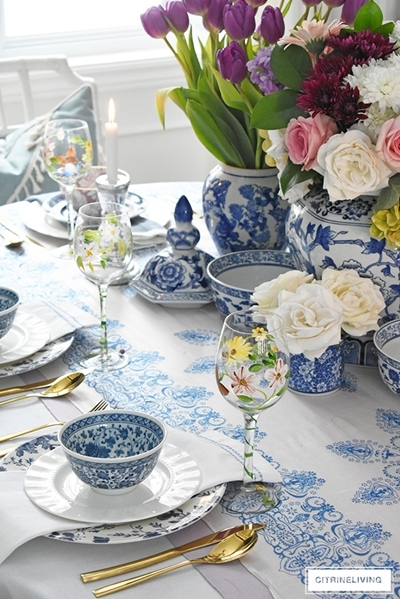 Lovely tablescape. I love that basket on the wall. this whole space has so much Beauty and character. 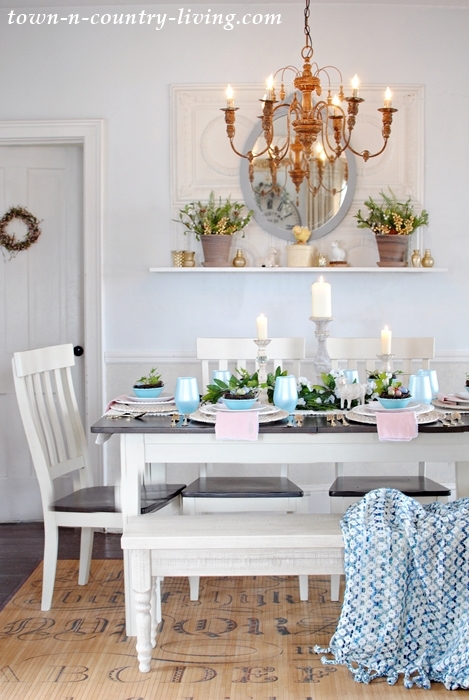 Oh, Jennifer, Your table is so lovely in its icy blue and white tones! Your azalea topiary adds such a lovely pop of color too. What a wonderful gift that was to receive! It’s delightful being on the tour with you! Jennifer, I love your table and all the pastels. Easter is one of my favorite holidays and you’ve captured it perfectly! This is so pretty, Jennifer! I love the little sheep and that topiary is stunning! First of all, I’m crazy about your azalea topiary!! It’s wonderful!! Love the soft delicate color mix here as well, but especially enjoy how the accent elements keep it grounded without getting too sugary sweet. Its just right!! 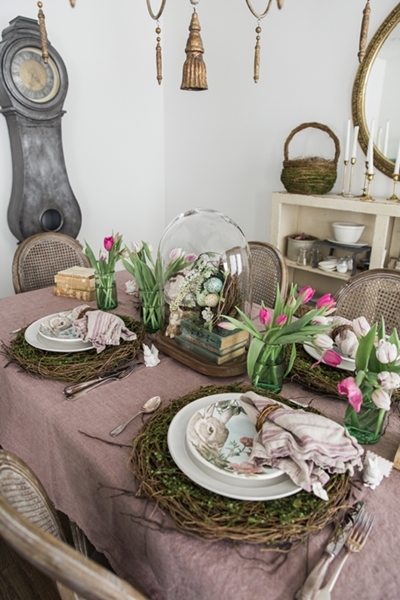 There are so many beautiful details on your stunning tablescape! Quintessentially spring! 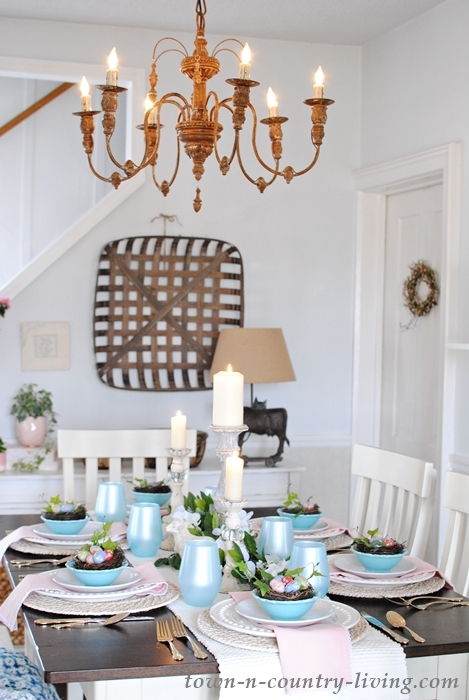 Your table is beautiful and the light and airy look perfection, Jennifer! My favorite photo is the last one with the shelf and wall arrangement. It reminds me of a fireplace mantel. I love it and how inviting it feels. 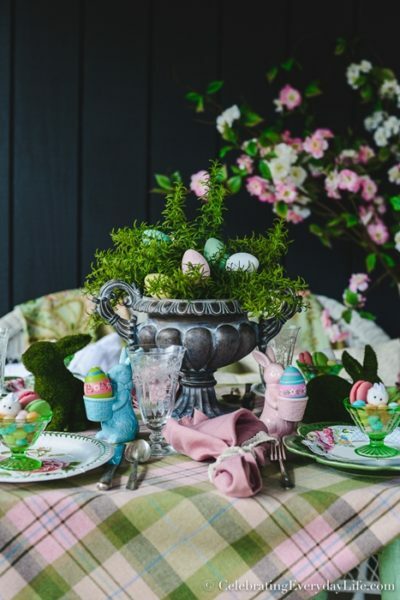 It’s a little early… but… Happy Easter! Very pretty table! Sure looks like a wonderful place to celebrate Easter dinner!